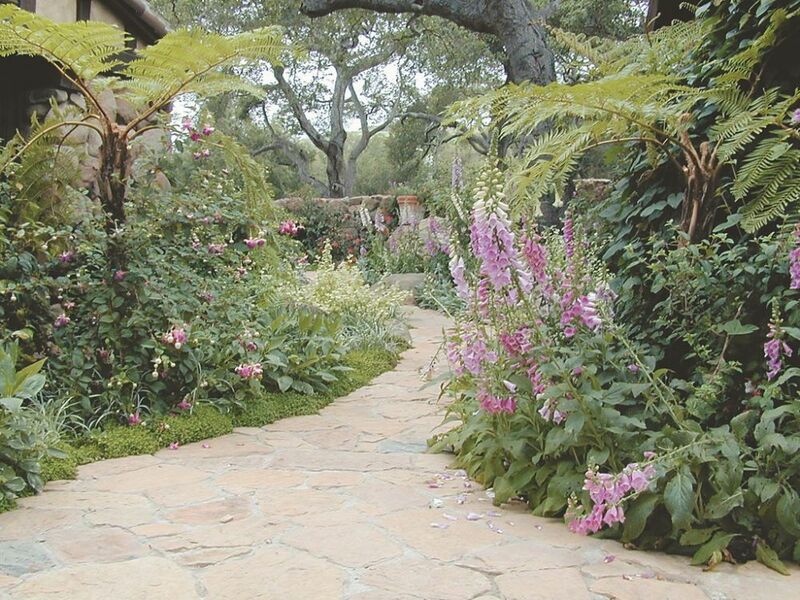 For most of the past four years, landscape architect/contractor/watershaper Mark Holden has devoted much of his professional energy to the creation of magnificent settings for Cima del Mundo, a grand estate high in the hills of Montecito, Calif. In two previous articles, he wrote about the nuts and bolts of the multi-phase project. Here, he steps back and offers a pictorial celebration to mark its completion. ‘Project of a lifetime” may not be enough to describe our work at Cima del Mundo. If you’ll recall, the hilltop home had experienced many changes since its original construction in 1925, including service as a makeshift monastery as well as a stretch of years in which the property was abandoned and allowed to go almost disastrously to seed. In all its history, however, the estate has never been through as much by way of transformation as it has in the past four years. Complete is the best word to describe what that transformation has been with respect to restoration and upgrading of existing structures and the addition of formal landscaping. But another word comes to mind in surveying the look of the just-completed project: authentic. Everything about the place looks and feels as though it could have been part of the original construction, right down to the period brass sprinkler heads we used (where they were plainly visible) in preference to modern plastic pop-ups. 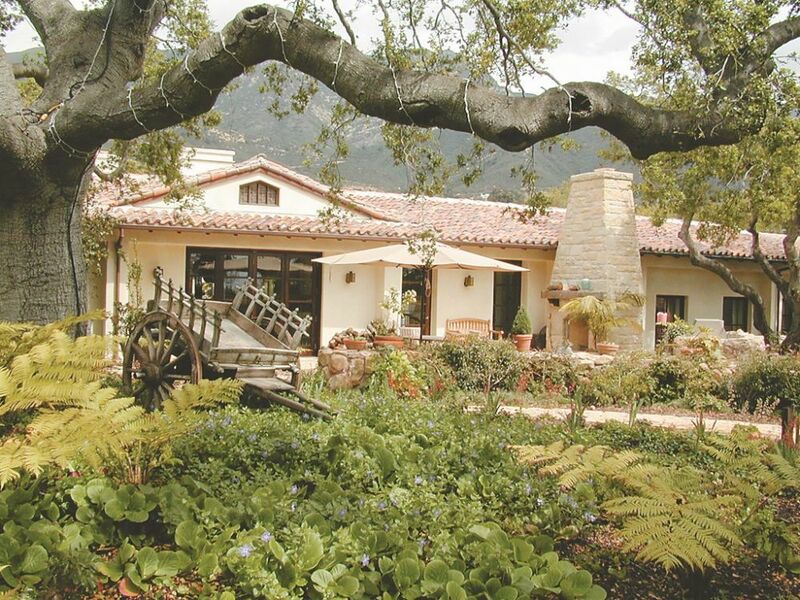 Everything that’s been done is true to the home’s Spanish Colonial roots and the inspiration of architect Myron Hunt, who designed the original house in the 1920s. Projects on this scale – with generous budgets and clients concerned with achieving true excellence in design, artistry and craft – are precious few in number. All of us who have been involved have a sense of privilege in having been asked to participate in the project. We’re also proud of what we’ve accomplished, somewhat relieved that our work is done – and satisfied to see the rebirth of this beautiful property become a reality. As is the case with so many significant designs, Cima del Mundo is rooted in the classics. In this case, the estate’s lineage can be traced across nearly 1,000 years to Moorish Spain. 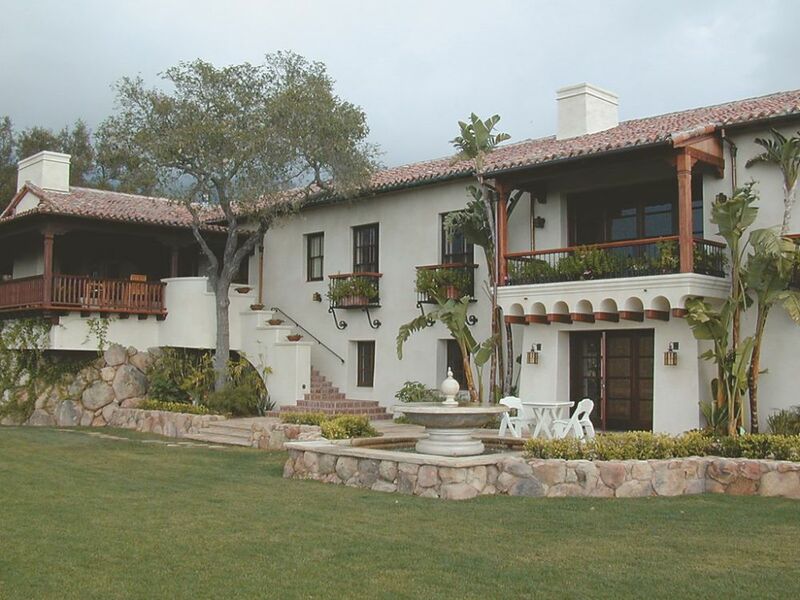 The home itself is in the Spanish Colonial style that was so popular in Southern California in the early years of the 20th Century. Cima’s architect, Myron Hunt, was a major proponent of this revival and, along with others including landscape architect A.E. Hanson, built or influenced the construction of homes in this courtyard-centered style over much of Southern California. In our work on the estate, we went to the roots of Spanish style and introduced echoes of the Moorish architecture found at Cordoba, Spain. Our octagonal courtyard fountain, for example, is borrowed directly from Moorish design principles, and the runnel connecting the fountain/spa with the swimming pool can be found in its original form at the Alhambra. We see it as our responsibility as designers and builders to recognize situations in which such motifs can be used effectively and appropriately. If there’s one lesson that stands above the many others we took away from this project, it’s that using, adapting and recognizing our design heritage makes us better and more creative in developing built spaces. The entrance to Cima del Mundo features a small stone structure that once served as the Manor’s gatehouse. The client wanted on-site lodging during the renovation and decided that the 1,000-square-foot cottage would be the perfect temporary home. What we found was a shell: The building had been stripped and was a rat-infested wreck – and we had just 60 days to design and complete its renovation to make it ready for a party the client was planning. What followed were 30 days of design work and site preparation chased by 30 days of harried construction – which left us a single day to pretty the grounds up for their premiere. Fortunately, the existing oak trees provided a beautiful canopy under which to work. We brought in ferns and flowers at full size to create an “instant forest.” We also diverged a bit from historical accuracy here – basically because 1920s planting plans tended to be a bit dull and also because we were pressed for time – and spiced things up with a few non-native plants, including fuchsias, hydrangeas and azaleas. The single watershape – a small, cast-concrete fountain – was installed in the back to highlight the axis running through the house and into the back yard. With our client out of the country, we were flying blind – but his last request before leaving was for the most comfortable landscape he had ever experienced. In response, I think we produced our best work to that date – and prepared ourselves mentally for moving up the hill to the manor house at Cima. 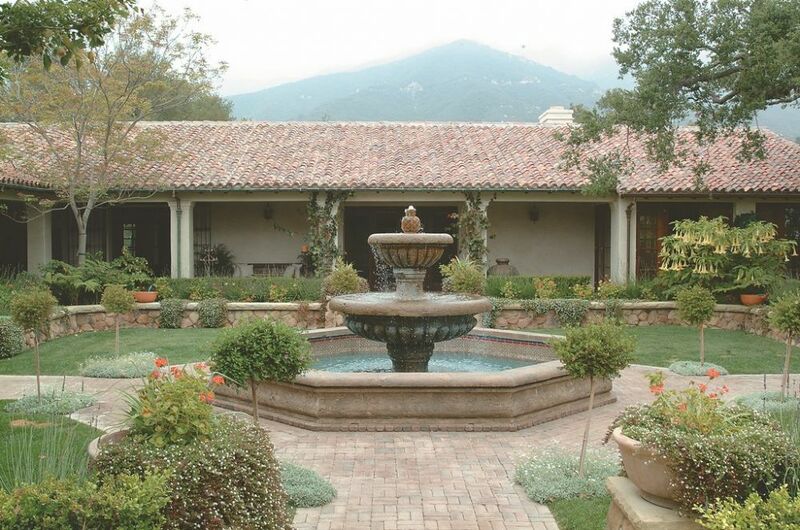 As we found it originally, Cima del Mundo was a beautiful, courtyard-centered home that had an empty space at its core. 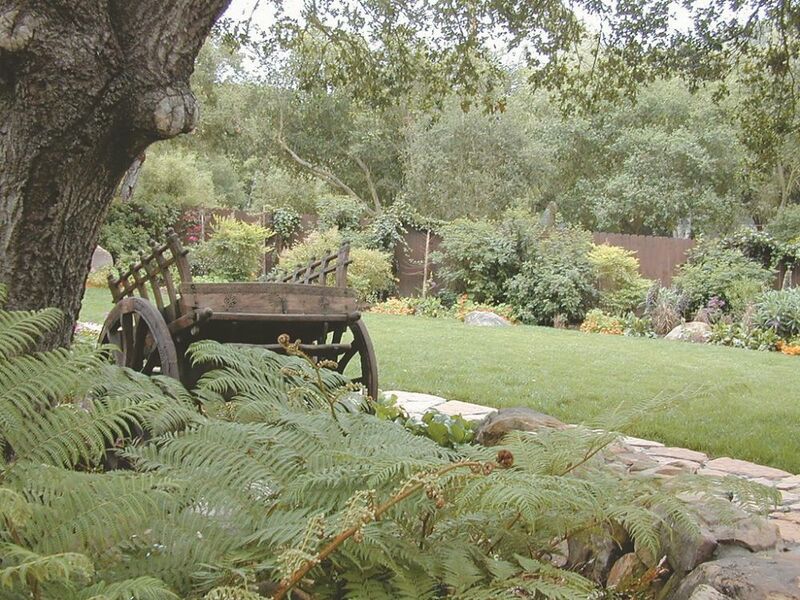 In fact, the courtyard was a wasteland where the home really should have found its physical and emotional heart. As a result, our first task on top of the hill was to graft a heart onto the scene – a magnificent core that would bring a sense of unity, vitality and joy to the overall experience. Now the courtyard and its central fountain are the first things you see when you enter the front doors: The home’s inner gallery sets a dark frame for the sun-filled space, and the sound of water can be heard from every one of home’s upper-level rooms. This inner realm served as a touchstone for the rest of the project and set the stage for all of the design elements that followed. In fact, the pool, main lawn and front entry all feature design concepts and finish materials that proved themselves first in the courtyard. Myron Hunt, the architect and designer responsible for Cima del Mundo, is best known for his more public projects, including the venerable Rose Bowl in Pasadena. He was the son of a nurseryman who followed his study of architecture at the Massachusetts Institute of Technology with another year of study in Italy, where he absorbed principles of Moorish and Spanish architecture as translated and expressed in the work of the designers of the Italian Renaissance. He returned to the United States and began his career in Chicago before moving to Los Angeles in 1903. In the following years, he designed the Rose Bowl as well as the Huntington Library in San Marino, the Ambassador Hotel in Los Angeles and a range of other projects that have withstood the test of time. He met Lora J. Knight, wealthy widow of a Detroit auto manufacturer, and designed Cima for her in 1924. When completed, the home played host to the era’s social elite: Charles A. Lindberg once landed his airplane on a field in the front yard – a visit documented on film now in the possession of the Smithsonian Institution. 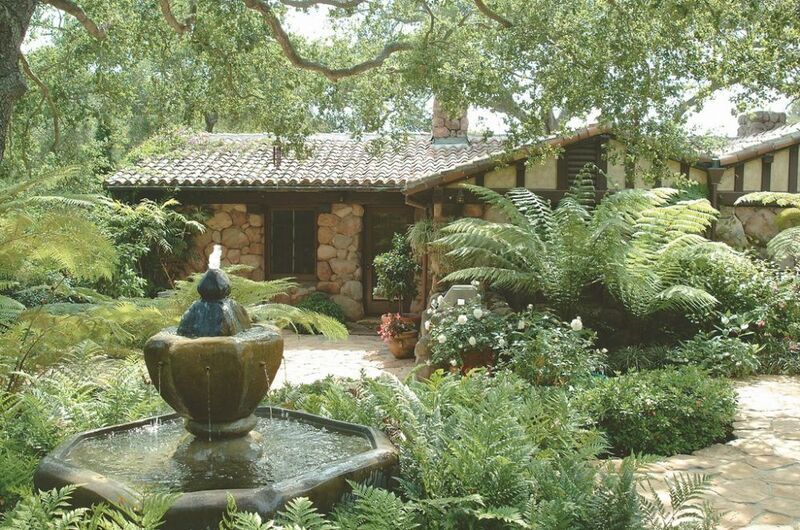 Today, Hunt’s plans for Cima and early photographs of the site are available through the University of California at Santa Barbara – an archive that proved invaluable to us in understanding both Hunt’s basic concepts and the unusual construction methods we ran into in the course of restoring the home and upgrading its utility systems. We even found unused designs for stone benches, gates and garden elements that inspired some of our work on the hilltop. As we saw in our last visit to Cima del Mundo, preparing the setting for the swimming pool and spa involved taking extreme measures to make sure those watershapes would stay right where we put them. Preparing and retaining the slope and setting up the system of piles and grade beams took many months, and it’s something of a shame that all of that hard work is no longer apparent to the casual eye. Indeed, the only things that visitors will see are subtle watershapes that subtly influence perception of the primary feature of the space – the view. 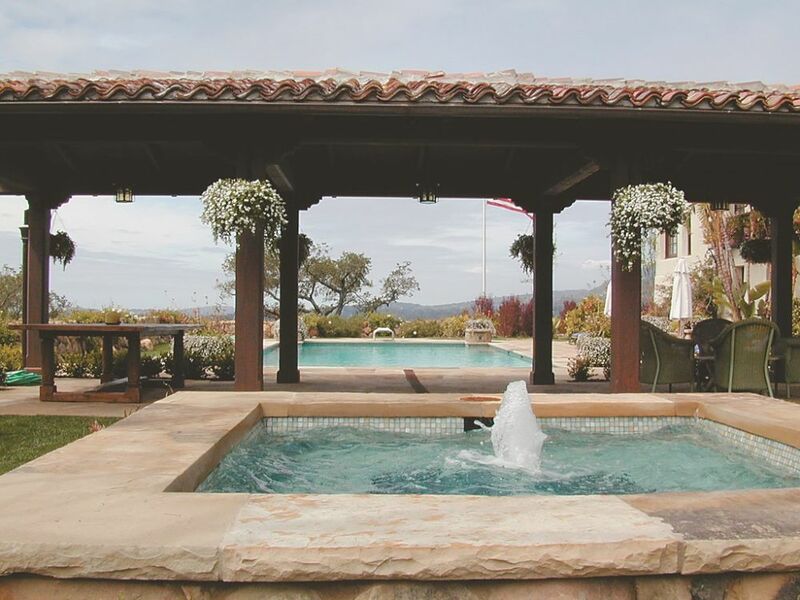 The view is truly the estate’s crown jewel, and we organized the entire space to maximize the enjoyment of it. Perhaps the discerning eye will see the Spanish Colonial and Moorish touches that run from the home and down across the pool and fountain/spa area, but the awe comes from looking past anyone’s “work” and partaking of the seemingly limitless vistas to the horizon. As a watershaper, I have devoted a significant portion of my life to creating the dreamscape at Cima del Mundo, but my fondest memories are less about the place than about the people I met and relationships we developed along the way. Through four years of the project, hundreds of people from all different trades and professions were assembled in a circus of environmental design and construction that literally blows people away when they see it today and hear our stories about it. To have been instrumental in such a production has been deeply rewarding. I can say with all honesty that this was the job of a lifetime, and my only professional wish is to be a part of another such project – one that has the same level of devotion to detail and the same level of dedication to excellence that marked everyone who came to work at Cima. 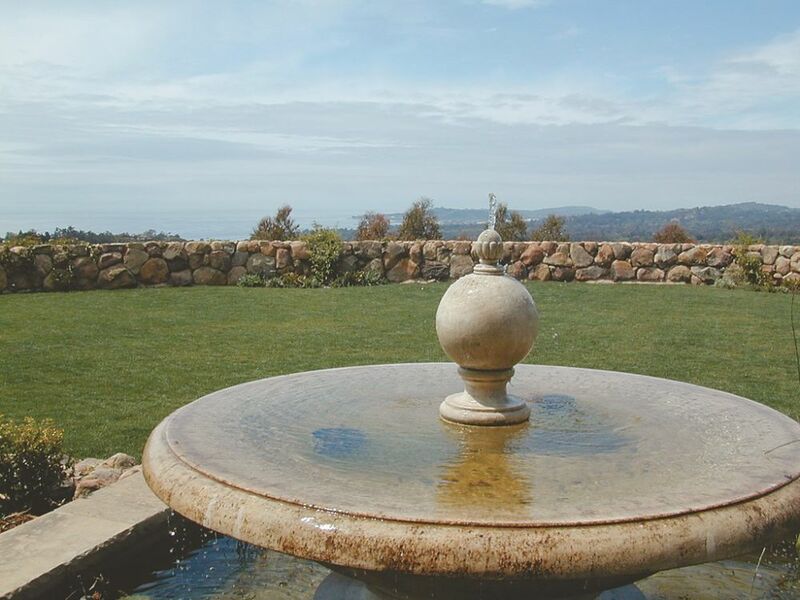 The limestone fountain is a reproduction to within an eighth of an inch of a fountain that our client particularly loves in a courtyard at the Bel Air Hotel in Los Angeles. The fact that it was hand-carved in Italy from our measured drawings is quite a story, but the most miraculous technical detail about this watershape is that we had to locate the equipment almost 350 feet away, where it’s tucked in a subterranean vault with the pool equipment. To pull this off hydraulically even with the fountain’s modest flow requirements, we had to install four-inch suction and return lines. A significant factor in this space was the fact that the architect never foresaw any use for this steeply sloped space, so there were no appropriate “back doors.” Given the two-foot-thick walls on the home’s lower level, cutting new portals was no small task, but now there are three that open visual and physical access to the backyard. One borrows architectural elements from one of Santa Barbara’s best known and most highly regarded structures, the County Courthouse. Another includes triple set of French doors that allow easy access from the lawn to the Brunswick designed and installed bowling alley. A third allows access to the “pool bar” and changing rooms. Although this and my two previous articles on Cima del Mundo (January 2001, page 32 and March 2002, page 60) might make it seem as though all the work happened outside the home, that fact is that our work on the interior was as painstaking, challenging and rewarding as our work outdoors. Restoring all the teak flooring, revitalizing all the intricacies of the architectural woodwork, putting a classic 1920s Brunswick bowling alley back in working order, refitting 20-odd seat screening room, refurbishing massive fish tanks and recapturing the glory of countless period fixtures – the project had something for every trade we could think of. What made it all work was an uncompromising commitment, inside and out, to quality at the highest level.